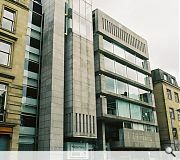 The Scottish Provident building, a B-listed modernist landmark in Edinburgh, has been flattened to make way for a speculative £75m office, retail and residential development. 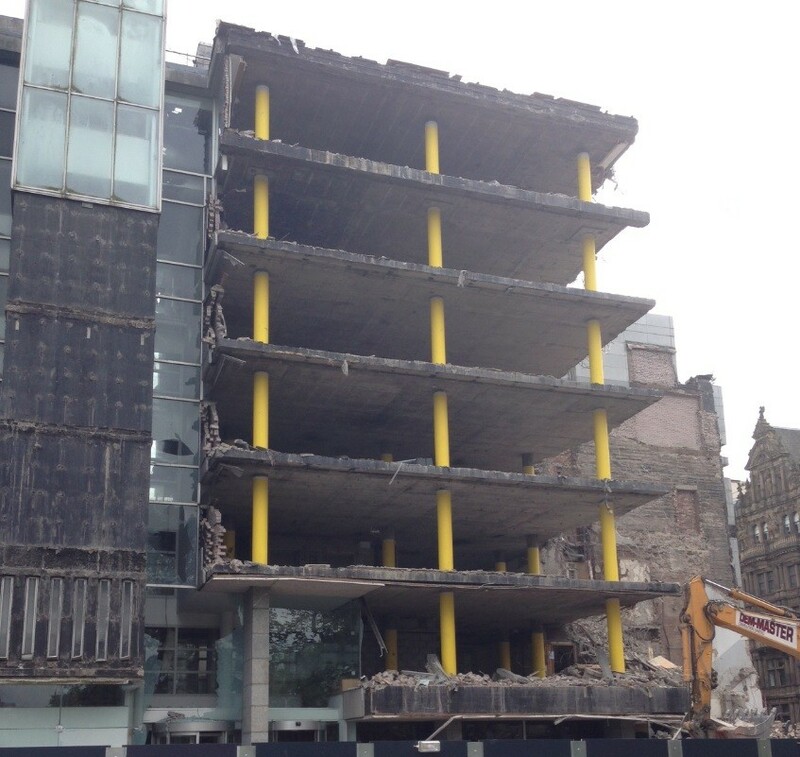 Malcolm Fraser, who took this picture, described the demolition as a ‘tragedy’ for the city, addong: "One of Edinburgh’s finest modern buildings destroyed – though the Gareth Hoskins/CDA proposals will glue a bit of the façade back on." 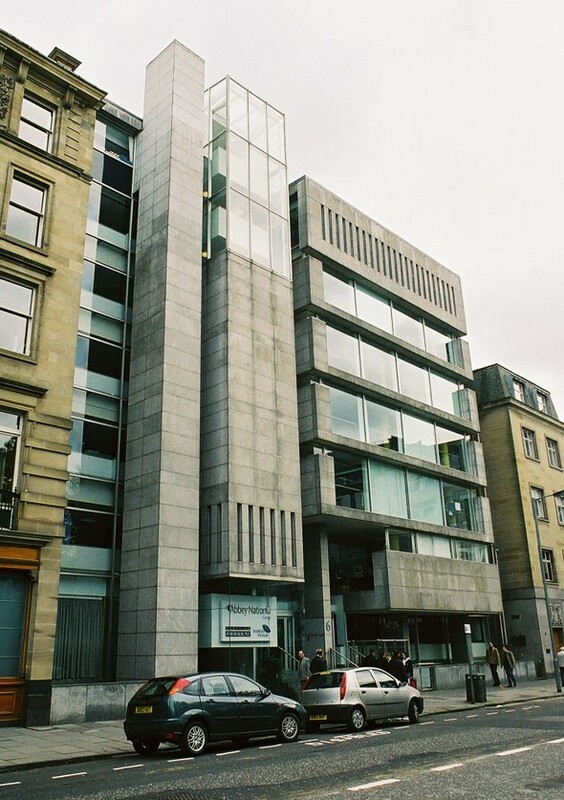 Edinburgh councilors gave the nod to the demolition following assurances that elements of the dismantled façade would be re-used in the new scheme, after ruling that dismantling and reconstructing the façade did not constitute demolition. Designed by Rowand Anderson Kinimouth & Paul the New Town landmark is being redeveloped by Standard Life and is expected to be complete by the end of 2016. Bets that they won't actually even reconstruct the facade? I wonder how many people who didn't go to architecture school consider this a 'tragedy'. 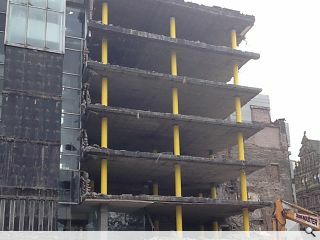 I'm glad to see this concrete modernist mess go but sadly the replacement will be pure ugliness. You're in a world heritage site. It's all beautiful classical architecture. There's a need for a new development. Yep, let's build something which doesn't fit in just so the concrete lefties can feel special and think it represents progress and modernity. Build a classical building. Beauty matters. Tourists coming won't stop and say "Gee Fabrizio, that wonky concrete building sitting amongst all these classical buildings is just so edgy. Wasn't it so brave to build it." Naw. What they'll say is : "Gee Fabrizio, what is that ugly lump there. It spoils the view to the Scott monument. Yuk. What daftie let that get built". Yes lets build classical buildings...because they're old they're automatically good. While we're at it why don't we all speak Latin to one another, sublime speech matters. I bet Fabrizio is gonna ditch that pal as he sounds a wrong'un. charlie, i wonder how many people that DID do to architecture school consider this a 'tragedy'..
Ah, so let's ignore the WORLD HERITAGE SITE STATUS OF THE ARCHITECTURE. Gotcha. Why ignore the immediate context Architrave? During an opera if Big Pavorotti suddenly started beatboxing, do you think everyone would go "well, isn't that just so joyous. The modern, urban infused sounds of beatboxing interjecting into some classical Verdi". Naw. They'd go " Boooooooooooooooo". And also, let's ignore the fact the building wasn't even fit for purpose. So, it's ugly, out of context and not even fit for modern day office needs. But aye, let's all cry now that it's coming down because some 'intellectuals' of the concrete lovin' fraternity have determined it is good and us lowly peepz know nothing about architecture....except when we see a turd of a building scarring the landscape. Fabrizio has plenty other friends. this Fabrizio, is he the guy that invented Fabreeze? I'm not arguing about the virtues about the building in question - but I find your assertion that we should build classical buildings forever more just frankly, ludicrous. Classical buildings shows us how proportion, light, form and order can contribute to the power of architecture - but to casually create facsimiles undermines those qualities. However there is no point going any further, as I am convinced you're here to take the proverbial. The facade is/was granite. Modernist? Yes. Ugly? A matter of opinion. But definitely not concrete! People develop new ideas for all realms which change people and how society interacts with its surroundings. Architectures job is to reflect this cycle. The building was an eyesore and unsuited to modern day office use. When will architects realise that tower blocks, concrete, glass or granite, whether they be sited at Fountainbridge, Quartermile or in St Andrews Square are simply out of keeping with the traditional building they sit in amongst and are what make Edinburgh special. Jane - this wasn't a tower block (it was actually shorter than the adjoining A-listed Forsyth's warehouse at No.3, which is being retained). The shame here is that it was actually a pretty enlightened example of contextual modernism, showing respect to the height and proportions of the surrounding blocks (and materiality, its granite matching that of the Basil Spence block across the way). It's also difficult to see how a 'traditional building' would be any better suited to modern-day office use so I don't find your argument particularly coherent. Aesthetically it may have divided opinion but it was part of a rich and heterogeneous streetscape - a complementary mix of buildings of all ages, which I'd argue is what makes Edinburgh special, and what is being lost here. Big Chantelle - I know you love to bang your anti-modern (and rather revealingly, apparently anti-Lefty) drum, but the day Edinburgh starts designing itself to suit the whims of some imaginary tourist is the day it dies as a real city. Also - the Scott Monument isn't remotely Classical. Nor the National Portrait Gallery. Yet they sit quite happily within the New Town and World Heritage Site. Would you call for their demolition too? Not once did I mention we should be building them "forever". You've made that up.Reading is fundamental. Just merely that we should build appropriate buildings for their location. The character of that area -- a world heritage site -- should be respected. The grey mess of a building didn't respect it. It was visually out of keep with the square's character and actually didn't even function for its intended use as an office. Having some blocky, boxy modernist building achieves what? Oh, it's seen as progressive for university types who studied architecture and think putting in something completely different to the established character of the site equals 'artistic bravery'. Naw. A building whose frontage respects the architecture character of the site but yet internally allows for modern function CAN be designed. The national portrait gallery and Scott monument are both shrines to brilliant stone architecture. Intricate in detail and stunningly beautiful. Classical, baroque and Victorian gothic all share architecture ambition. Different but brilliant. And complementary. Edinburgh does have to take tourists (and residents') feelings into consideration. That's part of being a "real" city. Betcha most ppl would vote for a classical building in that location as opposed to a wonky glass abomination if they were given a voice. I wouldn't demolish the two buildings you list. I would demolish all the modern tat on Princes street though. Since I know that was going to be your next question. Well which ever way one views the design of the now lost Scottish Provident building , sadly it remains of a higher quality than the standard of debate here. What is it about comments posting that brings out the bile in people? That's a nice straw man you've got there Big Chantelle. Good points #19 & 20. Debates pushed into extremes. There is of course a place for good architecture of any era and style. For my part, I think a not particularly great piece of modern architecture (yes I know other older buildings are going) that few if any non architects will miss is being replaced by an equally not great piece of even more modern architecture based on visuals seen so far. Far far too monolithic in feel - so it feels like a giant space ship has landed in the site. Sitting on the canal as part of the fountainbridge development or in Edinburgh Park, those vertical bronze fins and less sense of 'floors' might well look great. Filling almost one entire side of St Andrews square, it just feels like the architects are pushing this particular design idea in the wrong place. aside from the debate on style, this was one of the few interesting modern interventions in edinburgh (in my opinion) - I guess that corner of the square is going to be an easy target for anyone trying to illustrate the argument of styles!! The problem with picking a historic style to copy is that modern building methods/requirements wouldn't allow the same buildings to be built again, so the style becomes diluted and then you end up with a seriously compromised building. The debate here has lost the plot. The issue is that the original architecture is being retained. Buildings always get reroofed, re glazed, reclad. Architecture is the informed ideas and concepts behind how the materials are arranged. So as far as the beautiful, clever facade is concerned...what is being lost? I agree that most comments here are inflammatory baws by the way. Clearly not made by architects.